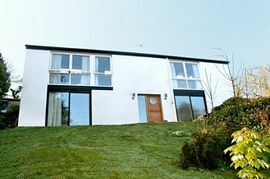 Catherine House is newly refurbished and dog-friendly, architect designed house set in a village location on the outskirts of Wadebridge. A character house, available for summer holiday season rental, it is surrounded by a stunning mature garden, fields and farmlands. 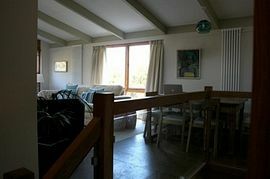 Ideally suited for the larger family group or two smaller families, the split level accommodation is airy, spacious and exceptionally comfortable. Located on the outskirts of Wadebridge, Catherine House is only 10 minutes walk into the town centre and minutes from the Camel Trail. It is a short drive to the beaches, golf courses and amenities at Padstow, Port Isaac, Rock (sailing), Polzeath (surfing) and Daymer Bay (swimming and windsurfing). Dog friendly - up to 2 dogs. 1 acre garden with kids climbing frame & trampoline. Veg garden, 2 patios and shallow stream. 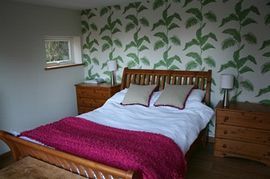 Local Services: Located in quiet village within walking distance of Wadebridge town centre. 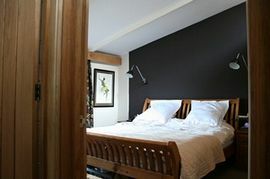 Minutes from the camel trail and a short drive to Padstow and North Cornwall beaches. Pubs, cafe's, restaurants and a cinema in town. 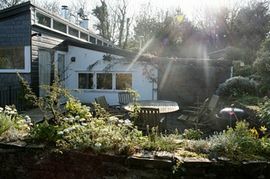 Catherine House is located in the quiet village of Trevanson in Wadebridge, Cornwall. Nearest station is Bodmin Parkway. Nearest airport is Newquay International. From the A30 into Cornwall, take the A395 at Launceston signposted Wadebridge/Camelford. Follow the A395 until Davidstow and take a left turn onto the A39. (Approximately 13 miles). Go through Camelford (4 miles) and continue on the A39 towards Wadebridge (11 miles). At the first Wadebridge roundabout take the 3rd exit and continue forwards on the large road bridge over the river Camel. Continue up the hill to the next roundabout and take the first exit into Wadebridge (western side). Go past a shell garage on the left and a Tesco on the right down the hill and take the left turn signposted Trevanson 1/2 mile. Follow Trevanson road over the flyover over the A39 into Trevanson village. Continue forwards until you reach a T-junction (opposite Longhayes house), then turn left and first right down a private track. Catherine house is the first house on the right. 25% non refundable booking deposit, balance required 6 weeks before holiday begins. Dog surcharge of £40 per dog per week. Saturday changeover - arrival 3.30pm and departure 10.00am. Available for 7 weeks only.